Abstract: Around back we see a typical colour coded set of IO ports with two big exceptions - the USB ports are in a different location and there is an onboard RJ-45 Ethernet jack. 3DMark2001 is the latest installment in the 3DMark series by MadOnion. By combining DirectX8 support with completely new graphics, it continues to provide good overall system benchmarks. 3DMark2001 has been created in cooperation with the major 3D accelerator and processor manufacturers to provide a reliable set of diagnostic tools. The suite demonstrates 3D gaming performance by using real-world gaming technology to test a system's true performance abilities. Tests include: DirectX8 Vertex Shaders, Pixel Shaders and Point Sprites, DOT3 and Environment Mapped Bump Mapping, support for Full Scene Anti-aliasing and Texture Compression and two game tests using Ipion real-time physics. Higher 3DMark scores denote better performance. No set of benchmarks is ever complete without a little 3DMark2001 action. Employing the 21.83 DetonatorXP drivers in WindowsXP we see some decent results (no system tweaking whatsoever). While these aren't the highest scores in the world, for a system which hasn't seen any major tweaking they are very good, and the increase of nearly 300points with the overclocking is good to see. I was a little wary of the SiS 645 chipset before working with the Soyo P4S Dragon for several weeks. The end result has been quite reliable, and the motherboard more than satisfying on the feature side. There really isn't much we could be asking for aside from possibly USB2.0 support or Firewire. Soyo have really presented the user with a valuable and trustworthy motherboard. The internal USB box could have been a bit more useful if Soyo had packed it with flash media readers, or more than just four USB ports. For the amount of space it takes up, the draped cables, and all the rest, the box is useful, but seems under utilized. The SiS 645 chipset allowed us to overclock out 2.0 GHz Williamette to 2.16GHz which is pretty good for this chip. Other boards have allowed us to go a little higher, but then again this is a Williamette we are talking about. It would be interesting to see how a 1.6A Northwood would handle on the Soyo, but for the moment we'll just have to leave that one rest. 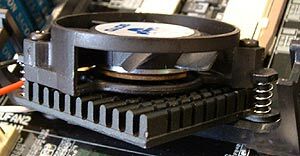 The onboard 10/100 NIC is not something overclocker's are going to like because they tend to see it as something which will just slow down their computer, and tax the CPU unnecessarily. While it can be disabled in the BIOS, onboard networking really does represent a great savings to the user. Under normal situations a NIC card costs about $25-30 CDN, and not having to spend that extra amount is more than a welcome sight. Thanks to the C-Media chipset on the PCB, really good quality sound is also effectively built into the all-black Soyo P4S Dragon. Bottom line, the Soyo P4S Dragon is a wickedly cool looking mainboard with everything under the sun onboard; networking, sound, USB 1.1, HighPoint IDE RAID, you name it. There is little find at fault on the Dragon, and from our experiences the reliability has been really great. Easily recommended!